The term “advertising” can leave a sour taste in our mouths. As consumers, we’re learning to block ads, skip commercials, and otherwise tune out advertising messages. As marketers and business professionals, we’re faced with the question of how to effectively advertise our business – and make sure we’re spending our ad dollars wisely. Done well, paid advertising can generate enormous brand recognition and return on investment. When done poorly, however, advertising can be a budget drain. When it comes to effective advertising and digital marketing, there’s a lot to learn as these scary – but true – statistics show. 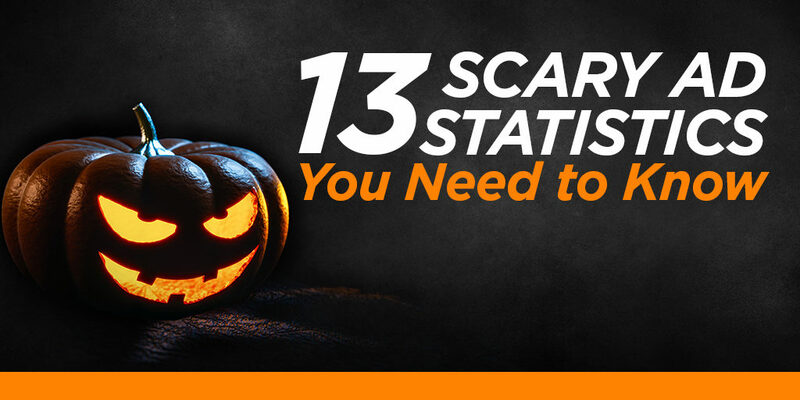 We even turned these chilling stats into an infographic at the end of this post. Click here to jump straight to it. Digital is dominating. With the explosion of digital advertising, marketers have long been wondering if traditional advertising is dead. While plenty of businesses are still spending money on traditional channels, many are cutting back budgets. TV remains the strongest bastion of traditional advertising, but it looks like digital is poised to finally overtake it. As digital channels gain traction, marketers are also losing faith in traditional advertising. One reason may be that traditional methods are notoriously difficult to measure. Digital tools provide an endless supply of metrics for marketers to prove ROI. Print ads and radio spots? Not so much. Furthermore, with consumers demanding personalized, “on-demand” services, most traditional channels can’t keep up with customization offered by digital tools. If there is one traditional channel going the way of the dinosaur, newspaper advertising might be it. 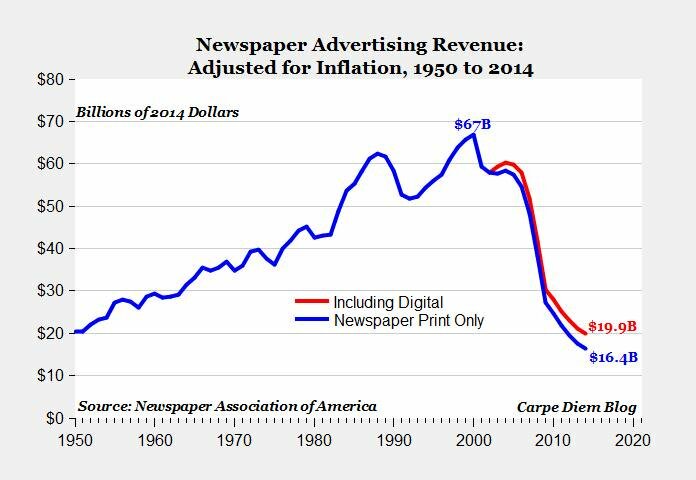 At their peak in 2000, newspapers brought in $67 billion in ad revenue annually. In 2014, they made only $19.5 billion. By 2020, they’re expected to capture only a mere 5.5% of the total U.S advertising spend. According to the DMA, direct mail has a higher response rate than any digital channel. Their study reported that display ads, email, social media and paid search all failed to reach even a 1% response rate. Don’t get too excited though – comparisons of email and direct mail still give the prize to email for the highest ROI. While it can be effective, direct mail also carries a much higher price tag. Death, taxes, and ads are pretty much all facts of life at this point. A well-cited article suggested that we’re exposed to about 5,000 branded messages every single day – and that was back in 2006. 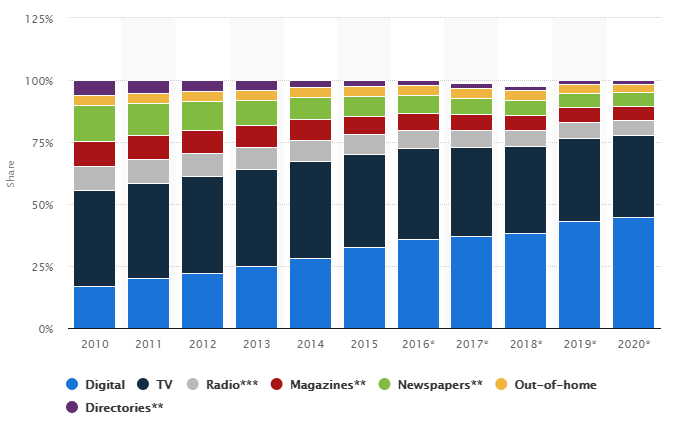 While some people claim that’s a gross exaggeration, there’s no doubt that digital advertising has exploded in the past decade. It’s not hard to believe there are more ads out there today – and certainly most people perceive it that way. Not only are there more ads, but we also find them more annoying than ever before. People spend a huge amount of time online consuming content, but they don’t like being interrupted by ads. Interestingly, people don’t hate all ads, just the ones that are the most intrusive. 83% of people agreed that not all ads are bad, but they do want to filter out the most irritating ones. Display ads – whether they’re banner ads, video ads, pop-ups, etc. – often get a lot of hate for being intrusive. Hence the frightening low click-through rate. Still, keep in mind that Google’s display network alone generates 180 billion ad impressions each month. Even .46 percent of 180 billion is still a lot of people clicking. Peoples’ response to annoying ads? Block them. Ad blockers are growing immensely in popularity across all channels, but especially on mobile. In fact, Adblock Plus, the leading ad blocking software has been downloaded over 500 million times. With digital advertising continuing to grow, you can expect ad blockers to grow right along with them. You know when you start reading an article, and suddenly there’s audio playing that you don’t know where it came from? You scroll back up the page only to discover a video ad started playing automatically. If you’re like 82% of other people, you probably leave the page. Despite auto-play videos becoming commonplace on Facebook’s news feed, most people don’t want them on other web pages, especially not with audio. Accidental clicks are an unfortunate reality of online pay-per-click advertising. Especially on mobile devices, most of us have suffered from “fat finger syndrome” before. In fact, Google reported that up to 50% of mobile clicks are accidental. While Google has measures in place to protect against accidental and invalid ad clicks, they’re not going to catch everything. Despite being touted as one of the best channels in terms of ROI, the open and click rates on email are often depressingly low. While it varies by industry, average open rates sit at about 22%, and click rates are typically less than 4%. No one likes spam, at least not of the email variety. Faced with overflowing inboxes, people don’t want to be annoyed by email that’s not relevant. Even worse, you might not even have the body of the email to convince them. According to the study, 69% of recipients report Spam based soley on the subject line. Pay-to-play is the name of the game when it comes to social media, particularly Facebook. 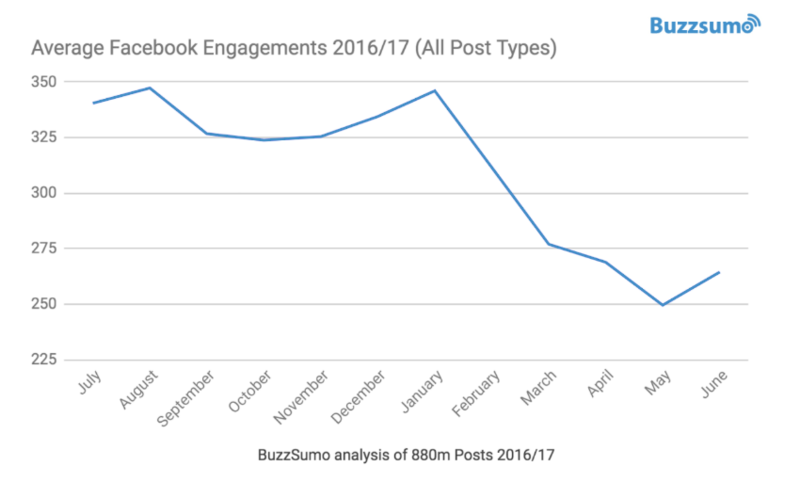 Facebook page managers have seen a massive decline in organic reach since about 2012. As more and more people are producing content, business pages are having a harder and harder time naturally hitting the news feed. A well-known study by social@Ogilvy cited organic reach at a mere 6% in 2015 and predicted it hitting zero in the near future. These scary statistics may paint a bleak picture of the advertising landscape, but many businesses are still finding enormous success with advertising. The U.S. ad industry is the largest in the world and expected to continue growing to over $207 billion by 2020. What’s the secret to creating ads that work? Good planning, eye-catching design, and a well thought-out distribution strategy can help you cut through the clutter to grab attention and reach your target audience. Another way to make your advertising more effective is to pair it with a strong content marketing strategy. 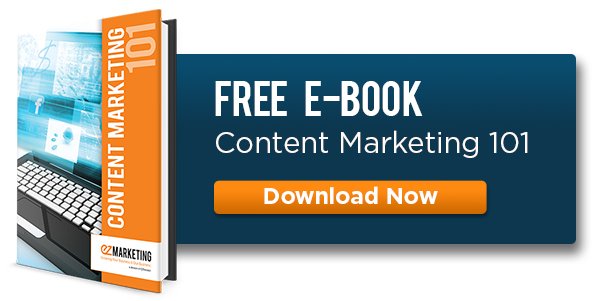 Creating relevant, valuable content (like the infographic above!) can give you more options for native advertising that entices your audience, and generates better results than typical display advertising. Need help getting the most out of your digital marketing dollars? Our team at EZMarketing is here for you!